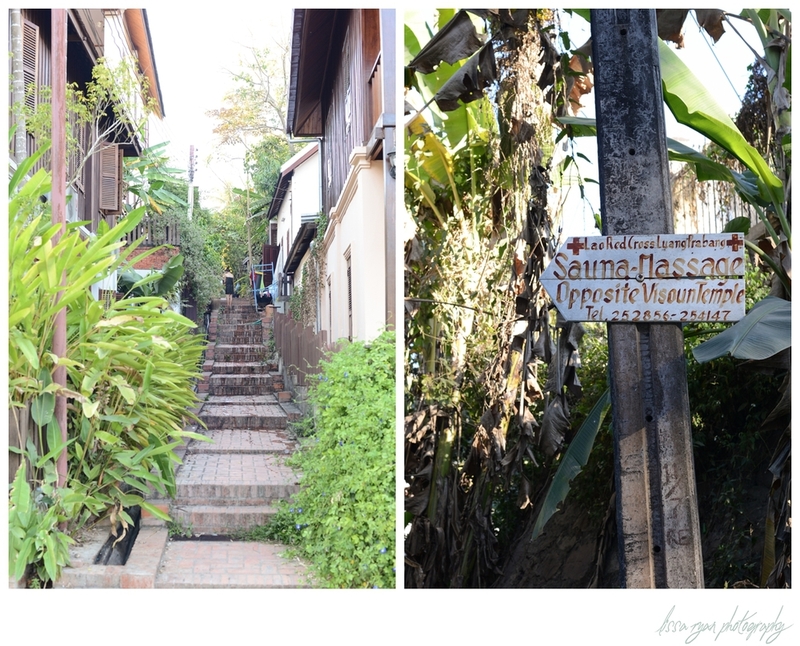 i apologize in advance for the size of this post, but we just loved luang prabang. it's impossible to convey in words just how special this town is, so i will let the images do the talking for me. 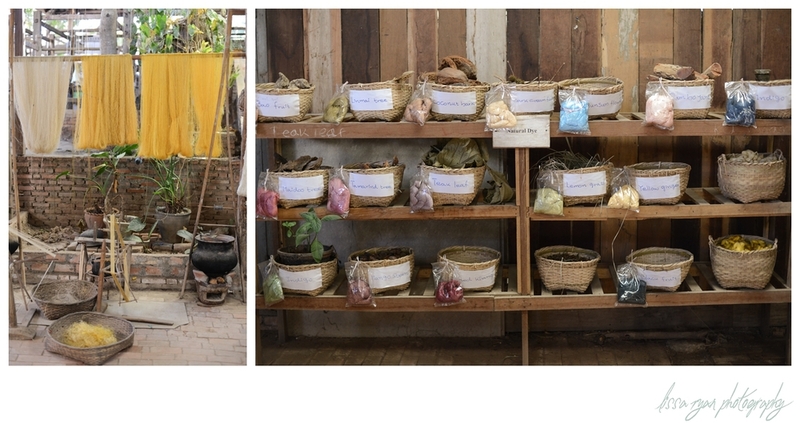 we spent the majority of our visit wandering up and down the city streets, admiring the french colonial architecture, eating delicious lao food (which, to my delight, tends to be very much like thai food except less spicy! 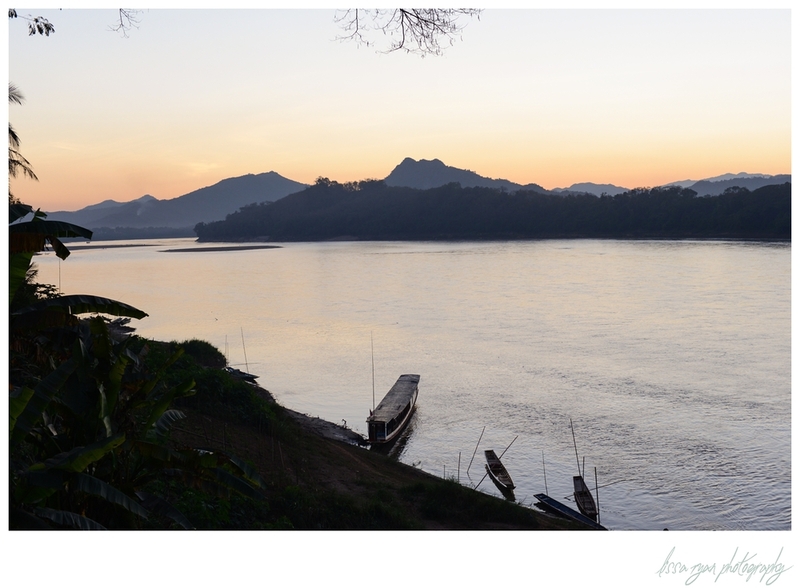 ), drinking - depending on the time of day - copious quantities of either lao coffee or beer lao, and soaking in the spectacular sunsets over the mekong. 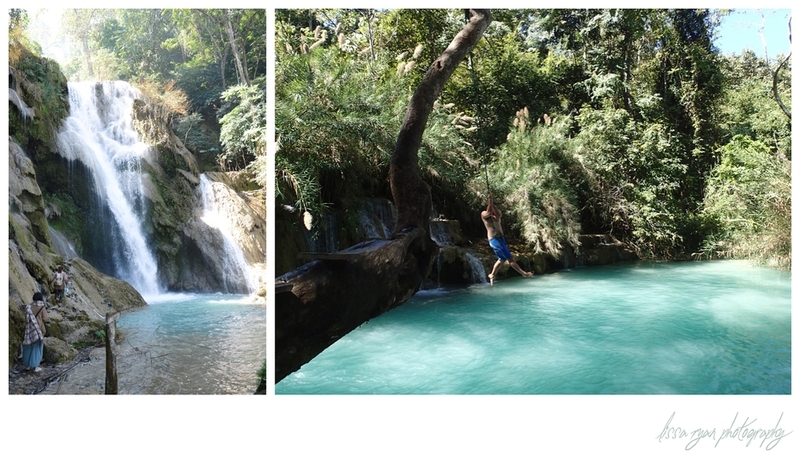 we visited the glorious kuang sii falls, with the crystalline blue pools at the base and may have enjoyed a ride on the rope swing into the bottom pool - even though the water was freezing! i thought long and hard about whether or not to post the following photo. ultimately, i decided to (obviously) - but only because it shows, in what i hope is a respectful manner, the last vestiges of a tradition that may not continue much longer. let me explain...in luang prabang, there is a centuries-old tradition of the local monks wandering the town at sunrise begging for alms and food from the faithful throughout town - called tak bat. it is meant to be a peaceful, silent and reverent ceremony, but it has become so overrun by tourists (who all seem to believe that they're destined to be the next pulitzer prize-winning photojournalist) that it's hard to imagine that the tradition will last much longer. tourists are asked to remain across the street from any processing monks, out of the way of the alms-givers, and quiet in respect of the tradition of silence observed during the procession. however, the morning that andrew and i went to observe, the tourists were loud, obnoxious, pushy and rude. they stuck their cameras directly in the faces of the processing monks, popping their flashes in the near darkness so that they blinded the monks, shouted and ran toward each new group of monks that arrived to take the alms, and often were so intrusive that the alms-givers were unable to hand their offerings to the monks and the monks were forced to abandon their paths in order to continue on with their procession. we were appalled. when we returned to our hotel, we were even more appalled to read various blog posts online complaining about similar behavior observed by other tourists on other occasions, implying that what we observed was not unusual. next week, we're taking the long and windy roads through the mountains of northern laos to vang vieng! catch up on the previous stops in our trip here: batangas, palawan, boracay, bangkok, chiang mai, the white temple, and our first couple days in laos.